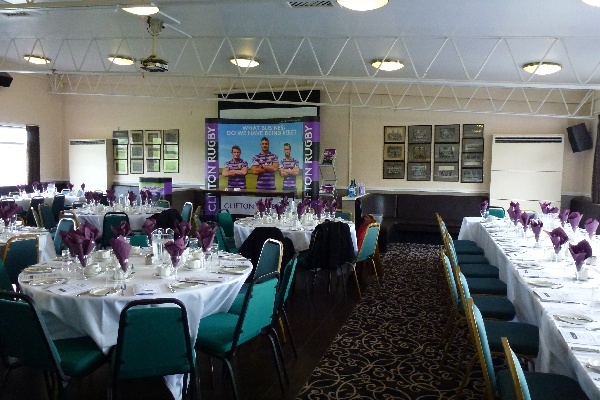 Clifton Rugby Club - A great place to have your party or function without breaking the bank. The main room for all major functions that will accommodate up 150 people. A member's lounge that can accommodate up to 50 people. It is ideal for christenings or smaller gatherings. Lots of free parking is available at all times of the day. The club does accommodate external functions, including business functions, wedding receptions and christenings. If you are interested in hiring it out for a function of any kind there is a room hire charge. Members get a reduced rate. For weddings and parties catering is available on a price per head basis ranging £5 to £30. We are more than happy for you to come down and have a look at the room before you decide if the venue is suitable for your occasion. We also ask for a deposit to secure the booking of 50% of the actual cost. If you are interested in booking the room, please call Les Robinson on 01179500445 at any time.